Grammy award winner Donald Ray Johnson Texas born vocalist/ drummer has spent a lifetime dedicated to music. He has performed with blues legends such as: Big Mama Thorton, Percy Mayfield, Lowell Fulson, Phillip Walker and Maurice John Vaughn. He has toured with R&B legends such as the Isley Brothers, the Commodores and Teddy Pendegrass. 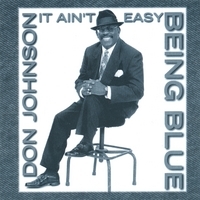 Best Blues Artist Vocalist (Real Blues Magazine) and 2007 Maple blues award nominee.